Lamp base freehand turned in 1 laminated section. Base is 6 1/2" round at the bottom" x 15" to neck cap. This lamp is an example of "inside-out" turning, where the Interior profile turned first, then the the blank is quartered and reassembled with the profile facing in. The exterior is turned to harmonize with the interior profile. 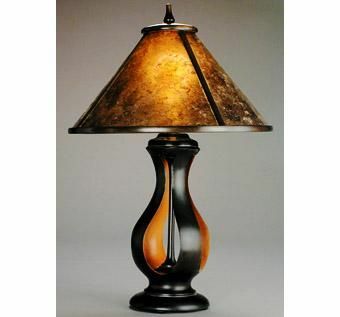 An ebonized center spindle is turned and installed to house lamp wire. Ebonized and natural cherry using a mordant chemical treatment. Brass fittings with either a 3-way socket with a 3-way 150w compact fluorescent bulb, or a 2 bulb cluster socket that can hold 2 100w (equivalent) compact fluorescent bulbs. The shade is of laminated ebonized cherry. Translucent panels are bigleaf maple burl veneer. Veneer panels use a special stabilization technique where the wood veneer is laminated with fiberglass cloth using a clear penetrating epoxy resin, leaving a laminate that is strong, stable and flat. It will not buckle or split. The shade measures 17" x 9 3/4" plus the finial. 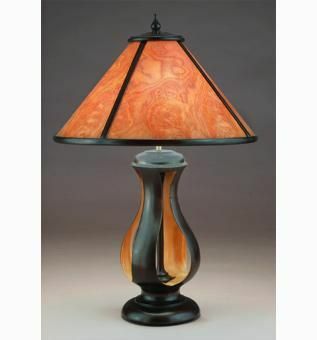 Also shown is the ebonized and natural cherry base with a wood frame shade housing amber mica plate. This is the traditional arts-and-crafts material. The third image is of the lamp base with the interior covered in silver leaf. The silver is treated with a jeweler's chemical that causes it to take on beautiful metallic colors, from green to blue, amber and mauve. The shade on this example uses a "pewter" mica plate. All wood parts fine sanded and finished with a catalyzed lacquer for a durable finish that will stand up to everyday use and care. Retail price as shown with translucent wood shade:$1095. 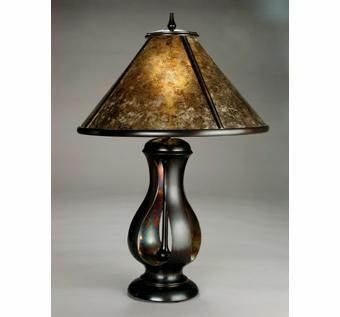 Retail price for lamp with optional mica shade: $1025. Add $60 for the silver interior. Bases and shades are available separately. Please contact me for more information, or to order. Many other pieces are shown on my web page.